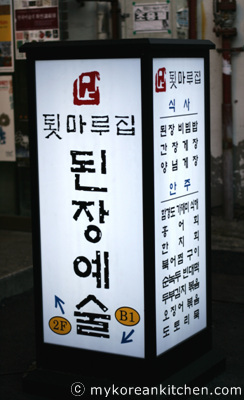 After a 5 hour long journey from down south, Gwangyang, we arrived at East Seoul bus terminal. We were barely able to move because our bodies were completely surrounded by heavy suitcases and backpacks. Although my tummy was badly rumbling like a small cannon, we couldn’t really stop for a break until we unloaded our luggage at the hotel first. After 30 minutes on the subway and 20 minutes of direction confused walking, our bodies were finally able to be free from our heavy belongings, and we hunted out for a late lunch. It was our first time being in Insadong. Everything was intriguing but also confusing. There were a lot of restaurants, but we didn’t know which restaurant to give our trust. 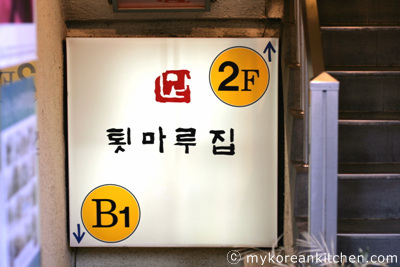 While we were wondering around every small street of Insadong, I found a restaurant that was on my visiting list. Hurray! I was so happy that I finally got to eat something after a couple of hours of starvation. 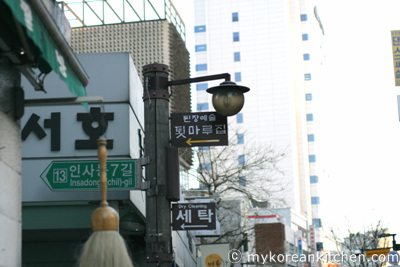 The restaurant is called Toetmarujjip (House with wooden verandah) Doenjang Yesul (soybean paste art). I thought it was a kind of weird name, because I never pictured soybean paste being artistic. This is the entrance. They have two floors, one in the underground floor and the other one upstairs on the first floor (second floor in Korea). I went to the first floor to get a better light for my photos (Apparently the underground floor is floor seating and the opstairs floor is bench seating). According to my homework, their specialty was soybean paste bibimbap. So without hesitation, I ordered it and this is what they served in less than 5 minutes. 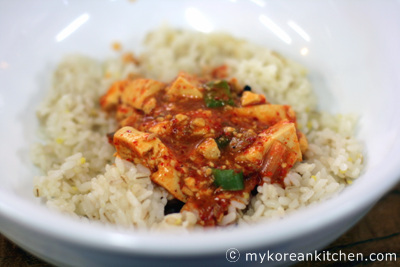 I added a little bit of garlic chives, endives and thick soybean paste stew in a bowl and mixed them like bibimbap. 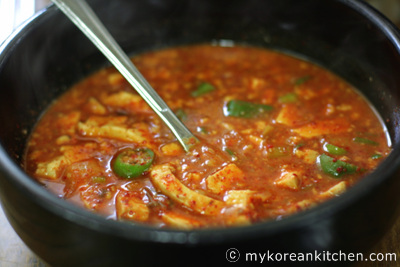 Thick soybean paste stew itself is quite salty but as a mixing sauce with rice, they compliment each other well. 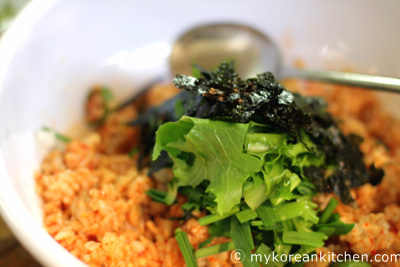 I didn’t think the bibimbap was spicy, though if you feel spiciness you can drink a spoonful of dried pollack soup to dilute the taste. 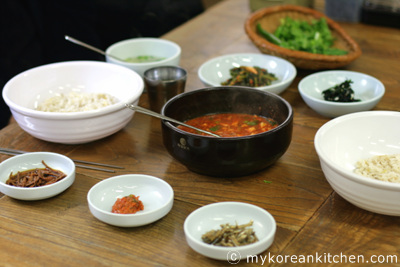 Merit : You can enjoy a Korean country style simple meal. PREVIOUS: What kind of cooking oil do Koreans use? Beautiful pictures that leaves my mouth watering! The stew looks awesome although I have to say that I can imagine how salty so much soybean paste can be (Northern Chinese doubanjiang, for example). This reminds me of BCD ToFu House (http://www.bcdtofu.com/main.php). When I lived in L.A. I lived two block away from the one on Wilshire Blvd. It was great, because the resturant was open 24 hours I could go there any time. I worked at night, so I could go in the morning for dinner/breakfast.